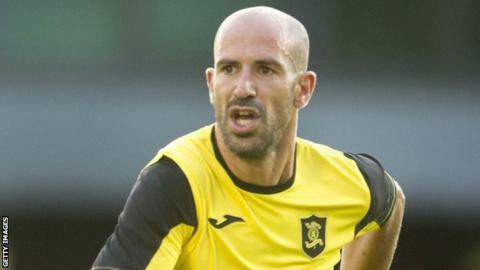 Former Portugal youth international Hugo Faria has secured a short-term contract with Livingston. The 32-year-old midfielder, who has already played for the Scottish Championship club as a trialist, has signed at Almondvale until January. Livingston manager Mark Burchill said: "Hugo has played at the top levels in Portugal, Cyprus and Greece as well as earning an under-20 cap for Portugal. "He brings a wealth of experience that will be invaluable this season." Faria began his career with Louletano before spells with two other clubs in his homeland - Uniao Leiria and Olhanense. His travels took him to Farul Constanta in Romania, Enosis Neon in Cyprus, Kalloni in Greece then Valletta in Malta. He spent last season with Apollon Smyrni in the Greek third tier but made only three appearances.